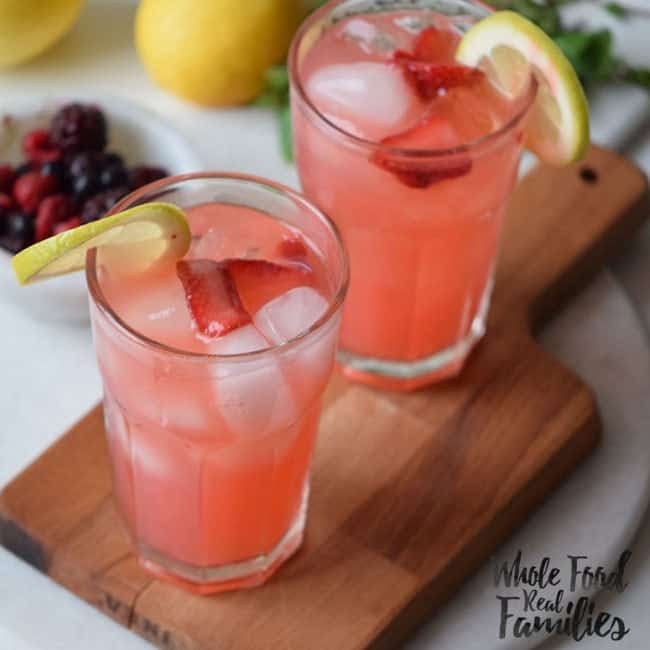 Nothing screams summer like homemade lemonade and this Berry Lemonade Cooler is going to be your new favorite way to cool off in the hot sun! Way down here in the south it is HOT and HUMID. Notice the all caps there. I was doing that for emphasis. I wasn’t actually shouting at you. Truly the south has a special kind of summer heat that combined with the humidity from living around marshland, can just make you miserable. As in, go get the lawn chair, let’s just sit here and sweat because there is nothing else I can stand to do today hot. This Berry Lemonade Cooler makes me think of those old movies about the south where women in very conservative dresses would sit around and fan themselves in the heat drinking a pretty libation out of a perfect glass. During the summer in Savannah, I am generally not hanging out in my lawn chair in a pretty dress. That is not very conducive to chasing the kids around the yard. More likely a t-shirt and cargo pants because they have enough pockets to hold all the junk my kids think I should be carrying. (They are very girly cargo pants – I feel like I should say that.) 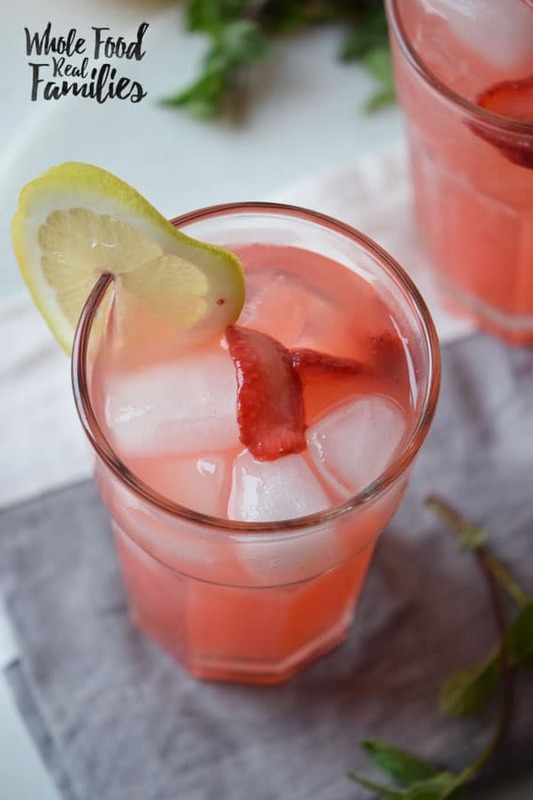 But I do love Strawberry Lemonade and this Berry Lemonade Cooler makes everyone happy when we want to keep playing but just need something to cool off. Lately Jeff and I have been doing lots of home projects, including refinishing some of our older furniture. Last weekend we decided to refinish two cabinets and our gigantic dining room table in the same day. What were we thinking?! We don’t have space in the garage for that big of a job and had to do it in the driveway… in the 98 degree heat. I am thankful we enjoy working together on projects like that because that one was a big one. (It works for us because I like the parts he hates and vice versa.) I am also thankful we still love each other after working on projects like that. That may or may not have to do with me spiking his Berry Lemonade Cooler. Just sayin’. What is your favorite way to cool off in the summer? Have you ever been anywhere hotter or more humid than Savannah, Georgia!? Rinse the strawberries and remove the stems. Add the strawberries to the blender with the water and honey or agave nectar. 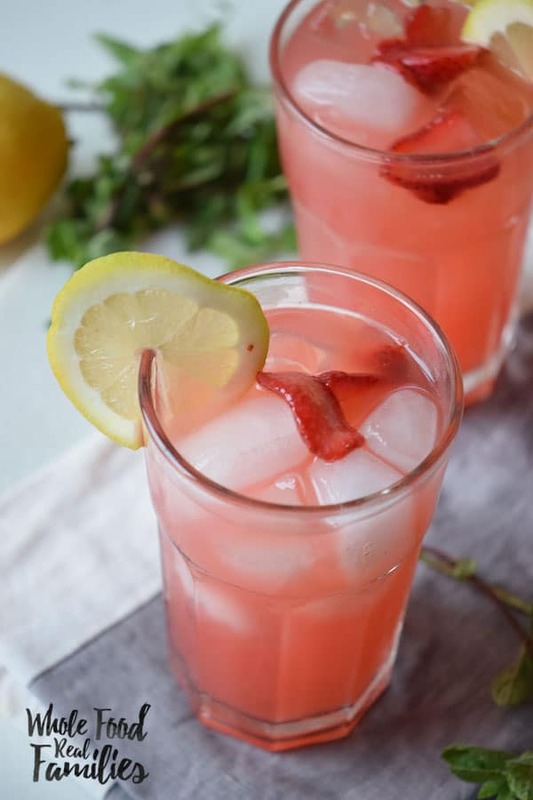 Serve over ice and garnish with sliced strawberries and a lemon wedge. Note: Swap the lemons for pineapple for a tropical kick. Or for limes for a Berry Limeade! Up north is no joke either! We have had 8 straight days of 90+! I’ll be making this drink for sure to beat the heat! Perfect way to cool off this summer! This is perfect for these hot summer days we have been getting. Berries and lemons go so well together. Love this lemonade! It’s so hot where I’m living right now so I am surely making this!